Be A Bookwoorm, Why Don’t You? In honor of the fact that classes are back in session, and the fact that Cornell has 20+ libraries for its 17,000+ students to choose from whilst they all scramble to study for exams (yes, even on the first day…) I’ve done a library for you!! For this manicure, I used one coat OPI’s Natural Nail Base Coat and two coats OPI’s Shi-merry Chic for the base. The colors of the books include Essie’s Lady Godiva, Misa’s Chocolate Icing, Orly’s La Playa, OPI’s Chop-Sticking to My Story, OPI’s Mrs. O’Leary’s BBQ, and Icing’s Envy (which you can barely see…) The details were made from OPI’s DS Radiance, OPI’s Golden Rules, Sinful Colors Black on Black, and the pages of the open book were Essie’s Body Language. I topped off everything with two coats of Seche Vite. OPI’s Shi-Merry Chic is a gold/taupe shimmer with tiny bits of glitter, copper round glitter, and flakies (very subtle). I didn’t think I’d like it but it turns out that I am in love with it. The base here was two coats and I would certainly do three if wearing it alone and out in public as its a bit on the sheer side. I could see how this would look wonderful around the holidays (as it was part of a holidays collection) sitting by a fire, letting the flames reflect off of the unique surface this polish creates. Definitely a holiday winner. Mrs. O’Learys’ BBQ is a maroon/brown creme that goes on smoothly and screams fall. It’s much deeper than a red creme but its not quite brown. In the bottle it looks purpleish, but when it translates onto the nail, the brown comes out and the purple disappears. It goes on in two coats, though I’m a habitual three coater for cremes. This entry was posted in Nail Art, Reviews and tagged black, blue, brown, Essie, gold, gray, green, Icing, Misa, OPI, orange, Orly, purple, red, Seche Vite, silver, Sinful Colors, white by Tara. Bookmark the permalink. What beautiful nail art. 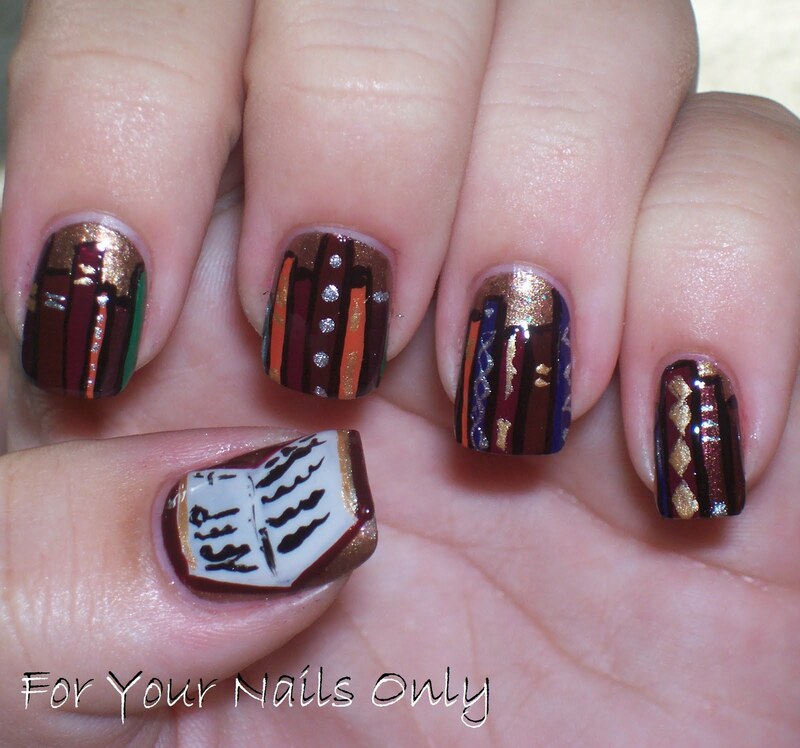 I have never seen a painted picture of a book, open book on someone nails before. The nail Art is gorgeous. Love you web blog. You used just about every nail manufacturer, Orly, Essie, OPI, Misa and Sinful. Isn't OPI's Mrs. O'Leary BBQ the nail polish that was named after the BBQ (or cow) that caused the Chicago Fire?